In order to keep accurate time, computers can synchronize with public time servers on the Internet. However, a private time server is sometimes required for reason of security and/or maintainability. 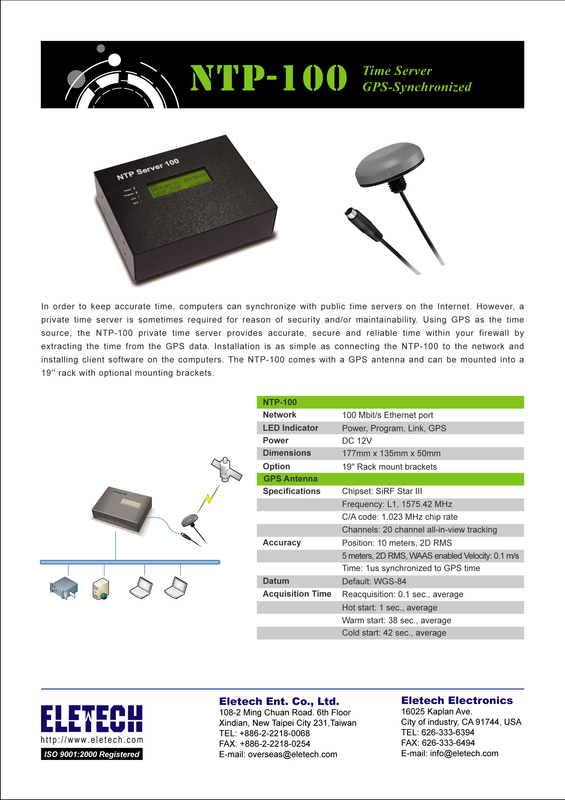 Equipped with an internal GPS receiver, the NT-100 provides client computers within the LAN with accurate, secure and reliable time extracted from GPS data. System setup and management are quick and easy with browser based user interface. The NT-100 comes complete with a GPS antenna and can be mounted into a 19” rack with optional mounting brackets. Installation is as simple as connecting the NP-100 to the network, hooking up the antenna and installing client software on the computers.